On Wednesday I was back at DCMS to attend the first meeting of the new Participation and Excellence Programme Board. The purpose of this group is to oversee the department’s progress against its targets on cultural opportunities and participation and encouraging excellence. Chaired by DCMS Director General Andrew Ramsay, the Board comprises three DCMS Directors and the Chief Executives of five Non Departmental Public Bodies (Arts Council England, English Heritage, Sport England, the Museums, Libraries and Archives Council and the National Museum Director’s Conference) and me. It’s wonderful that the importance of the voluntary arts is now being recognised to this extent and very exciting to be part of this new Board. Our first meeting was largely a progress report on existing DCMS initiatives relating to participation and excellence. I look forward to helping to develop further how the voluntary arts sector could be involved in these and future activities. On Tuesday I was at the Department for Media, Culture and Sport in London to meet the new Director of Culture, Mick Elliott. Mick, who previously ran the Royal Liverpool Philharmonic Orchestra, replaces Alan Davey who left DCMS to become Chief Executive of Arts Council England. We talked about the ‘Our Creative Talent’ research commissioned by DCMS and ACE and the joint conference we ran at the Barbican at the beginning of July. We also discussed the ‘Find Your Talent’ scheme and the work DCMS is doing in relation to the McMaster excellence agenda and how the voluntary arts might best get involved in these. On Thursday I was in London to meet Stuart Etherington, Chief Executive of NCVO. Stuart is working on developing NCVO’s civil society agenda and is having a series of one-to-one meetings with organisations representing independent schools, co-operatives, housing associations, trade unions, universities etc. Having discussed the role of sports clubs in civil society with Tim Lamb from the Central Council for Physical Recreation, he was keen to have a similar conversation with me about voluntary arts groups. This fits well with VAN’s own vision of “an empowered, participative, fulfilled and healthy civil society” and it was great to hear that Stuart sees the voluntary arts as a key component of civil society. It will be interesting to see how far NCVO can take the idea of a more collaborative approach to developing civil society in the period leading up to the next general election. 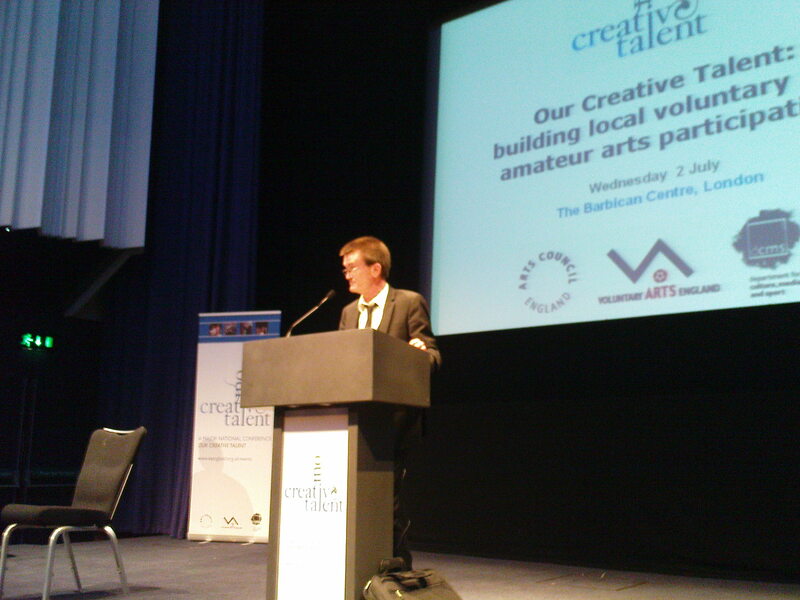 On Wednesday I was back at the Barbican for ‘Our Creative Talent: building local voluntary and amateur arts participation’ – a joint conference organised by Voluntary Arts England, Arts Council England and the Department for Culture, Media and Sport. The event was fully booked weeks ago and attracted delegates from voluntary arts umbrella bodies, several government departments, local authorities from across England, voluntary sector agencies and lots of officers from Arts Council England as well as representatives from Scottish Arts Council and the Arts Council of Wales. It was very exciting for me to be sharing a platform with Margaret Hodge, Arts Council England Chief Executive Alan Davey and Feargal Sharkey. The Minister started by saying “I hope and believe that this conference marks a significant change in the way we think about the arts and what we call ‘the arts sector'”. She called the research “a significant new landmark in our understanding of how and why people participate in the arts” and said “we have been paying too little attention to such an important part of the arts ecology”. Margaret Hodge said “I firmly believe that the health of our arts depends on both the professional and the voluntary sector – the two are closely and directly dependent on one another”. In my speech I stressed the importance of moving beyond marvelling at the statistics and starting to work out how to unlock the enormous potential of the voluntary arts. I explained that what voluntary arts groups want and need is recognition, involvement, capacity-building and challenge. I finished by suggesting that this conference was possibly the most important moment for the voluntary arts in the 60 years since the establishment of the Arts Council – but added that it would mean nothing unless it was the start of an ongoing dialogue to realise the potential of the voluntary arts. Alan Davey said “from an Arts Council perspective the voluntary arts isn’t a footnote or appendix to the arts in England today: it is part of the core script”. He announced that in the coming months Arts Council England “will be working with Voluntary Arts Network to agree a plan of how we play a role in building on the strengths and successes of the sector by working with local government and other key partners”. The conference also included detailed sessions on the ‘Our Creative Talent’ research, Arts Council England’s segmentation model of arts engagement, the development of a Participation Manifesto, the VAE/Media Trust ‘Up for Arts’ campaign, local authorities and the NI11 arts engagement indicator and the 2012 Cultural Olympiad. There was a real buzz throughout the day and the feedback has been incredibly positive. It really felt like a significant turning point and it will be vital that we quickly build on the enthusiasm generated. Congratulations and many many thanks to everyone involved in a wonderful day for the voluntary arts. 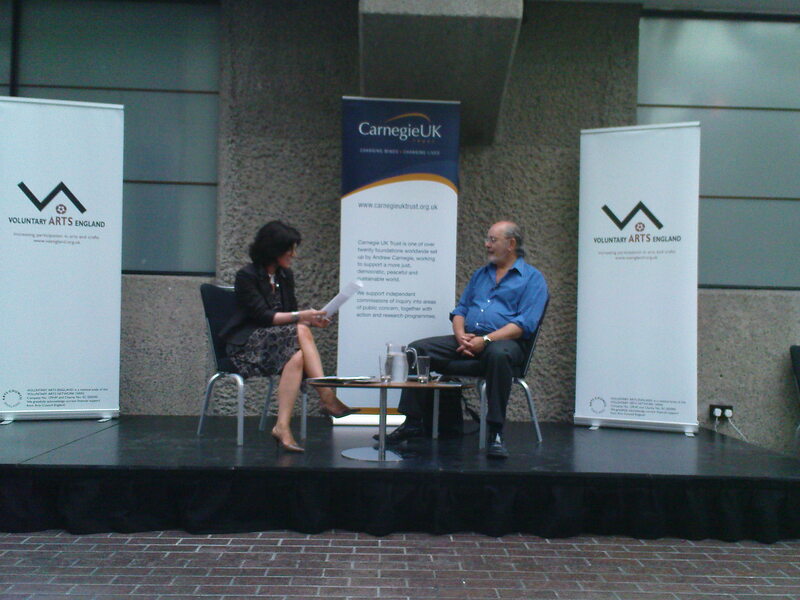 On Tuesday evening I was at the Barbican in London for the pre-conference reception hosted by the Carnegie (UK) Trust. Kate Braithwaite, Chief Executive of the Carnegie Rural Commission, welcomed delegates and Voluntary Arts staff gave examples of the organisation’s activities across the UK and Ireland. The talking was interspersed with some excellent voluntary arts performances including madrigal singers, drummers, drama, storytelling and a chamber choir. The formal proceedings concluded with the launch of the new Voluntary Arts England publication ‘Edutainment: the benefits of arts and crafts in adult and community learning’ – a collection of case studies edited by Paul Devlin. Susanna Reid (from the BBC1 Breakfast programme) interviewed Professor John Benyon (Institute of Lifelong Learning, University of Leicester) who wrote the forward to ‘Edutainment’ about lifelong learning and the arts and crafts. Guests then enjoyed the last few hours of the hottest day of the year eating, drinking and networking in the delightful surroundings of the Barbican Conservatory – “a hidden tropical oasis in the heart of the city”. We are enormously grateful to the Carnegie (UK) Trust for supporting an inspirational and entertaining event and to everyone who helped to make it such a memorable evening. On Monday I was in London to chair a meeting of the Association of Chief Executives of Voluntary Organisations (acevo) Arts, Culture & Heritage Special Interest Group. Gail Robinson from the Department for Culture, Media and Sport joined us to discuss the department’s Third Sector Strategy. The new version of the strategy is going to focus on six themes: recognition, voice, the compact, accessing support, social enterprise and local authorities. We agreed that voluntary and community sector organisations in the arts, culture and heritage are often not perceived as part of the third sector but also tend not to see themselves as part of the third sector, thereby missing out on substantial available support. We also discussed mechanisms for DCMS to engage with the acevo Special Interest Group on a regular basis and talked again about the Charity Commission consultation on fee charging. Finally I reported back to the group about the DCMS/Arts Council England seminar on Excellence and the Voluntary Arts on 4 June, which had arisen as a result of the Special Interest Group’s meeting with Culture Minister Margaret Hodge in January.